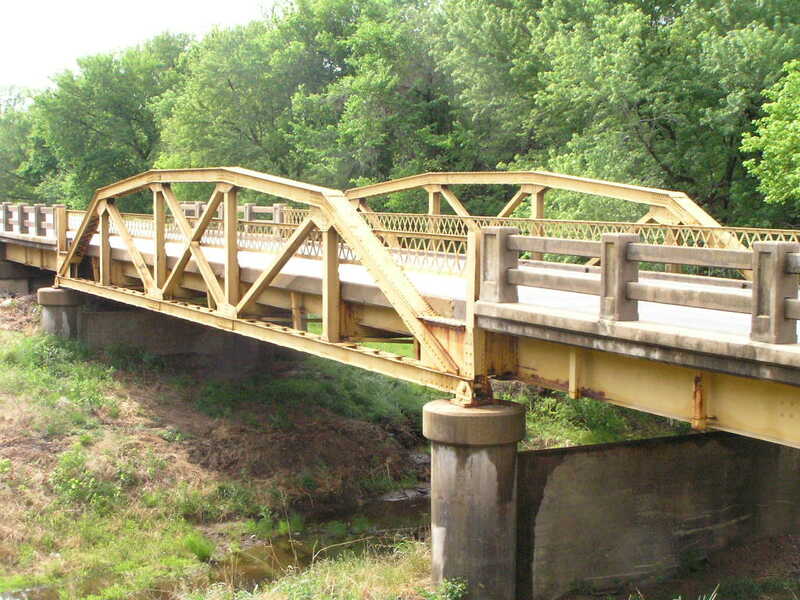 Built in 1931, this 80-foot parker pony span stands just a few hundred yard from an old through span over the same creek that was only built 6 years earlier. 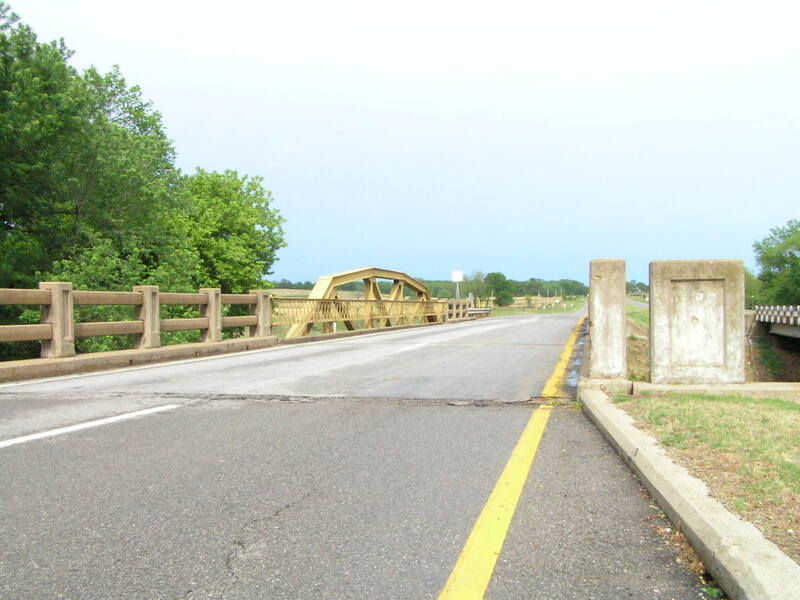 Thus, this bridge serves as evidence to not only the rapidly changing importance of US 66, but to the changing requirements of modern highways as well. Above, an over view looking through the bridge. 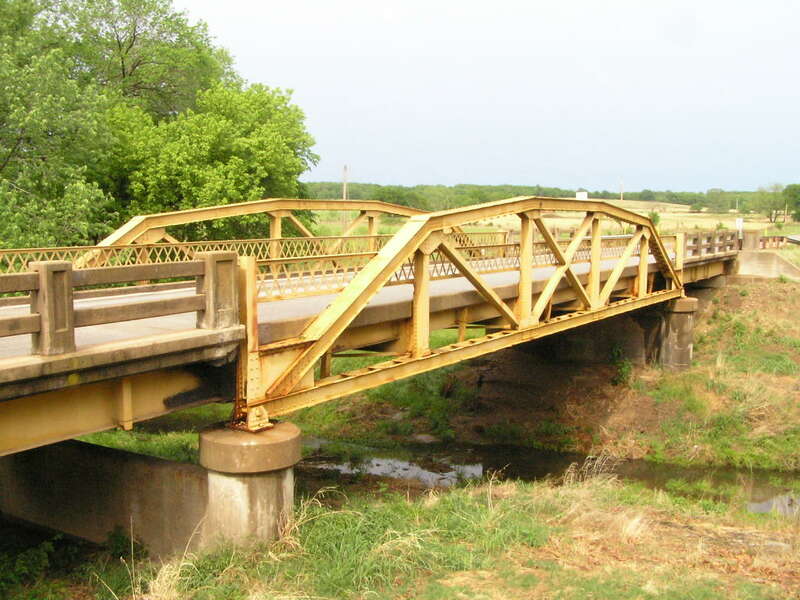 This bridge shares the same type of lattice safety guards as the 1926 structure, and is also an Oklahoma standard design. Below, an angled view of the bridge from an elevated position. This was a very dependable design used all over Oklahoma, and very prominently on US 66. 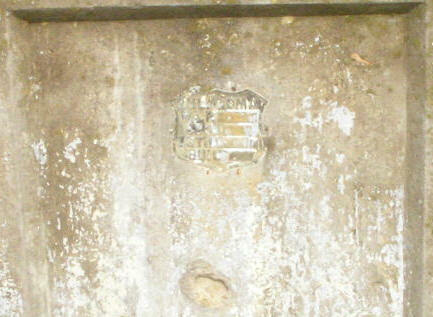 Above, the shield shaped FAP (Federal Aid Project) plaque located on the wing post. Unfortunately, the year, length, and other important data have been ground off, so we had to get the year from the inventory list. The picture below will clarify why the wing post is so named. As you can see, the abutments extend a considerable length from the side of the bridge. These extensions are called "wings", thus a post mounted thereon is a "wing post". Wingposts were common from about the late 1920's to the end of the 1930's, when, for reasons probably related to safety, they fell out of favor. You can also see the panel detail in the posts of the "fence" style concrete rails. Below, another detail of the railings. These were in such good condition that they were well worth photographing. Intermediate posts are almost always narrower. Above, continuing on, we see the approach span where it meets the mainspan. 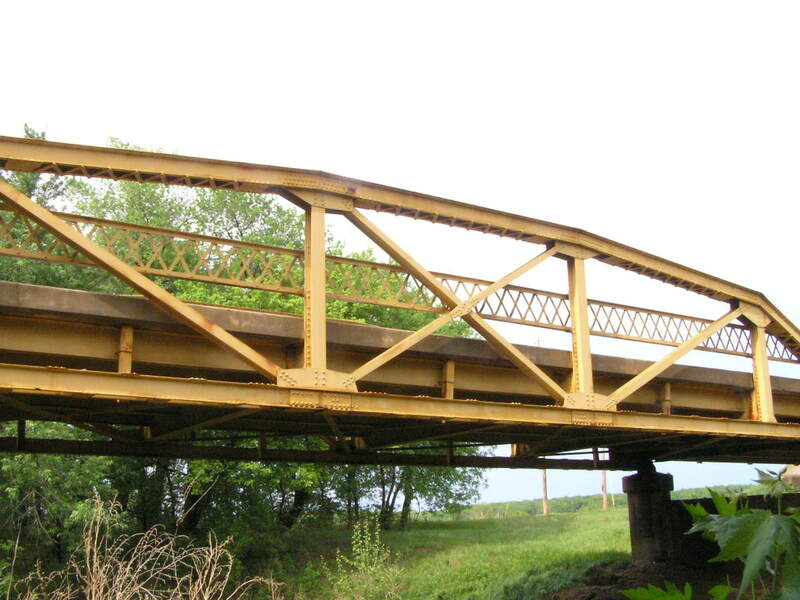 The approach is a steel stringer span, and uses the floor beam of the truss span. 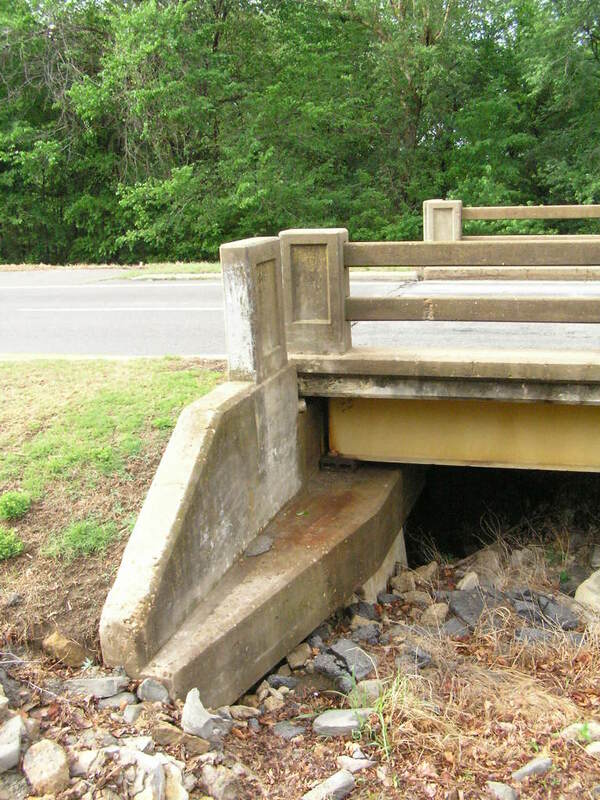 Wider and heavier bridges will often use a separate beam here for the approaches. 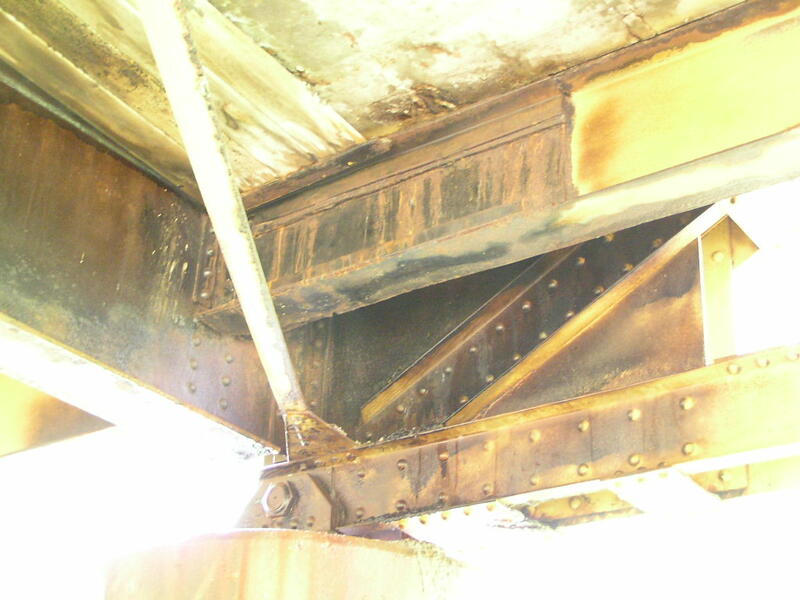 Below, an under side view showing some of the repair work that has been done on this bridge. 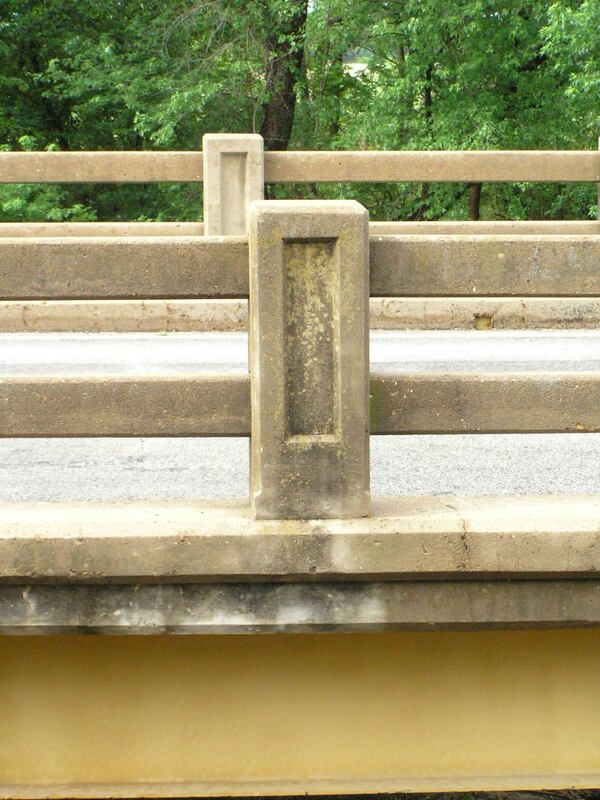 For an in-depth discussion on some of the repairs that have done on Oklahoma's bridges, I highly recommend the Ash Creek page. Above and below, two additional views of the truss. 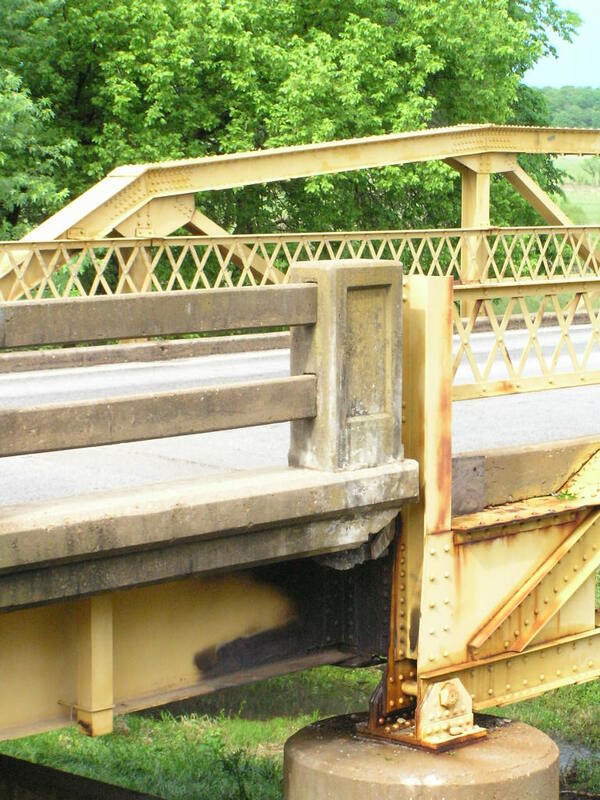 This bridge has weathered quite well, and it is remarkable that it is still, in spite of continuously changing demands, still in use, considering it predecessor was only used for 6 years. The bridge now serves westbound traffic, perhaps so people traveling the so-called "right" way to travel on old US 66 can cross it still en route to the west.